Log cabin cladding is a natural fit for homes or cabins in a mountain setting. But that wonderful hand-hewn log cabin look comes at a high price -- real pine or cedar timbers are extremely expensive to purchase, transport and install. Vinyl log siding is a less-expensive way for homeowners to get that rustic, log cabin look and avoid the high costs associated with using real timber. The Woodworkers Shoppe of Comins, Mich., specializes in a variety of real log paneling. Costs for covering one wall, 8-by-25, is $575 for pine logs, and $934 for hewn cedar. Multiply that number by the other walls in your home, as well as trim and corner pieces and pre-finished stains, and costs can run more than $10,000 just for materials. Buffalo Lumber of Woodbury Tenn., sells high-grade, pre-finished chinkless cedar logs for $6.29 a square foot. For a 1,500-square-foot home, the cost of materials would be almost $9,500 -- without trim or corner pieces. Faux Wood Beams of Deer Park, N.Y., recently introduced a lineup of new vinyl log siding at a cost of $34.10 per panel, which covers 7.81 square feet. Each panel weighs just over 4 pounds. Cost of materials for that same 1,500-square-foot home would be about $6,500. Vinyl siding accessories such as starter strip ($3.18 for 10 feet), J-channel ($10.30 for 12 feet) and corner trim ($33.14 for 10 feet) can bump up the costs, but it still is thousands less than using real log cladding. The vinyl log siding from Faux Wood Beams comes in four different color choices: Spice, Cypress, Vermont Maple and Smoke. Other manufacturers may be less expensive. A.W. Graham Lumber of Flemingsburg, K.Y., sells 2-by-8 vinyl log cabin cladding starting at $.89 per linear foot. Quarter-sawn. 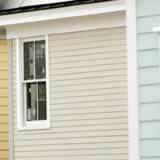 These boards are usually made from 2-by-6 or 2-by-8 cedar or pine and are the most economical choice. Half-sawn. These boards are thicker -- and more expensive -- at 3-by-6 or 3-by-8, but they are still more economical than full logs. Premium log. These hand-hewn logs are 3-by-8 or even 3-by-10 and are shaped like a "D."
Vinyl siding manufacturers may not have all three options in their product lineup. Consult with a salesman before settling on a purchase.